Fans of the box office smash The Greatest Showman are being invited to roll up to Clitheroe for a song and dance spectacular. 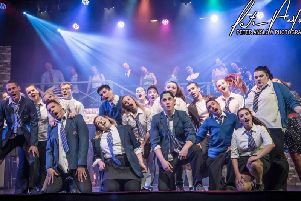 Hugh Jackman’s musical is a worldwide hit, and a local production company, led by Chipping singer Max Fox, has this week signed up for a nationwide tour and a debut date in London’s West End for their tribute show. First, though, the talented troupe will unveil The Greatest Show for Families at the Grand Theatre. “I woke up one morning and I had this idea as I was obsessed with The Greatest Showman – I’d watched it eight times,” said Max. “It is an iconic film, and as well as performing songs from the movie, we will be doing the best ones from musicals Wicked, Moulin Rouge, Hairspray and Disney classics. “Honestly, the last few weeks have been a whirlwind, and I can’t believe we are going to play at some of the biggest arenas in Britain with a show I dreamt up a few months ago. Max added: “The cast is from Lancashire, and the show has already sold 6,000 tickets in Newcastle, Leeds and Belfast. And there’s an extra special surprise for Greatest Showman fans, with the cast offering a masterclass to a handful of lucky youngsters who can take part in the Clitheroe show. “It is a brilliant experience for children, and they can gather around the piano with the cast and sing those amazing songs,” said Max. Showman Max cut his teeth working in holiday parks and shows in Blackpool, and also appearing in the Jerseys, a tribute to Franki Valli and the Four Seasons. February 16th and 17th: masterclass: 5-15pm to 6-15pm; show: 7pm.